DRPA & PATCO provide transit-related alerts and advisories by text message (SMS) to registered mobile devices. The alert system is powered by Everbridge, a recognized leader in mass notification systems and allows PATCO to provide alerts and advisories in a reliable manner. IMPORTANT! This is a new alert alert system and replaces the Authority's previous system which in recent years has become unsupported, unreliable and unstable. Previous subscribers MUST re-register for the new system in order to meet Telephone Consumer Protection Act (TCPA) compliance guidelines by providing express written consent they wish to receive the Authority's alerts. Select the KEYWORD category of alerts & advisories you want to receive. Text the name of the KEYWORD category to 888777. You will receive a response text message confirming your registration. Repeat steps 1-3 for each KEYWORD category you want to receive. Make sure you receive registration confirmation for each KEYWORD category for which you register. Please re-register for any category that is not confirmed. 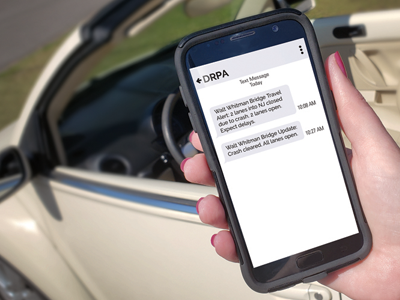 DRPA Alert and advisory messages about events affecting DRPA bridge travel such as significant disruptions, motor vehicle crashes, hazardous conditions and travel restrictions. BFBWALKWAY Messages regarding changes in the Ben Franklin Bridge Pedestrian Walkway hours. PATCO Weekdays 6:30 a.m. to 7 p.m. Messages and updates for train service interruptions on weekdays of 10 minutes or more. PATCONIGHT Weekdays 7 p.m. to 6:30 a.m. Messages and updates for train service interruptions at nights of 10 minutes or more. Messages and updates for train service interruptions on weekends of 10 minutes or more. PATCOSTATION Messages affecting train station amenities such as parking, escalator or elevator outages. DRPAPATCO Every alert and advisory message regarding DRPA bridges and PATCO. This includes messages from all 6 categories listed above. If at any time you decide to stop receiving text message alerts and advisories, simply text the word STOP to 888777. If you register to receive two or more categories of alerts and advisories, you can stop receiving one or more categories of alerts and advisories, or you make changes to the categories of alerts and advisories that are sent to your mobile device by texting the word STOP to 888777. Doing so will clear all of your category preferences and unregister your mobile device. You may then re-register your mobile device to receive the categories of alerts and advisories you want to continue to receive. There is no limit to the number of times you may start or stop receiving alerts and advisories from Nixle or change your category preferences. If you decide to stop receiving our alerts and advisories, you may resume the service at any time by simply re-registering your mobile device following the instructions above. While the text messages are free, users are encouraged to contact their wireless service provider to determine whether they will incur additional charges for receiving text messages on their mobile device. The text alerts will complement the travel alerts the Authority currently shares on social media. The Authority provides this information as a service to the general public. While every attempt is made to provide accurate and timely information, estimates of the nature and duration of any particular service change or other event are subject to conditions beyond the control of the Authority are difficult to predict. Those relying on this information should do so at their own risk and neither the Authority nor any of its employees or agents shall be liable for the accuracy of this information or any actions taken as a result.